Anyone who wishes to understand Israel’s politics must understand Benjamin Netanyahu. Bibi, as he is known in the Jewish state, has been the country’s dominant politician for the past two decades. Say what you will about Netanyahu, no one – from supporters, to opponents, to enemies – is indifferent to him. The prime minister’s capabilities and achievements are indisputable. His mistakes are similarly well-known. Benjamin Netanyahu is the most powerful orator within the Jewish state. In the United States, he knows to achieve the maximum public effect better than any other foreign politician in his speeches and interviews. Both in Israel and abroad, the Likud Party leader’s polarizing effect is second to none. His public pronouncements solidify the approval of his supporters while intensifying the antipathy of his adversaries. Netanyahu is well aware that he is a divisive figure, and that is a risk he is willing to take. The prime minister is so convinced of his powers of persuasion that he ignores anyone who advises him to moderate his language, either in his own interest or in the interest of his country. This is particularly evident with respect to Netanyahu’s most famous address. In a scorching speech delivered before both houses of the U.S. Congress in March 2015, Netanyahu made a last-minute appeal for a veto of the nuclear deal with Iran that had been negotiated by the U.S. government, the other permanent members of the UN Security Council, and Germany. In this, Netanyahu failed on a grand scale. His speech only served to deepen what had become a nearly irreconcilable rift with the Obama administration. Netanyahu’s opponents, however, claimed that his speech was nothing more than a cynical ploy. Netanyahu, they said, was perfectly aware that his mission would fail; the true purpose of his speech was to solidify support within Israel during the final, critical phase of his election campaign. And indeed, Bibi was re-elected. But whatever the merits of this argument, it fails to appreciate the prime minister’s overweening ego. Benjamin Netanyahu sees himself as a statesman of the first order, on a par with Winston Churchill. Just like the British prime minister, who in 1940 was the only head of state to defy Hitler, the Israeli politician sees himself as waging an uncompromising battle against the hostile Iranian regime. But here, too, prudence rules the day. Even though the overwhelming majority of Israelis and the most important Arab politicians are convinced of the potential threat arising from Iran’s nuclear weapons program, and even though then-Minister of Defense Ehud Barak – a former Chief of General Staff of the Israeli army and head of the Labor Party – urged a preemptive strike on Iran’s nuclear production facilities, Benjamin Netanyahu decided against such a move. And he did so even though his own popularity within Israeli could only have benefited from such an attack. But with Israel’s national interest in mind, Netanyahu exercised restraint. He understood that such a preemptive strike would have led to the complete isolation of Israel on the international stage, particularly with respect to Europe and the U.S., both of which the Jewish state relies on for support. Throughout his political career, Bibi has remained true to his convictions, even to the temporary detriment of his own political fortunes. As finance minister under Ariel Sharon (2003-2005), Netanyahu did away with unnecessary regulations and cut public subsidies, measures which breathed fresh wind into the Israeli economy. The establishment of an unfettered market economy and the elimination of subsidies benefited the more affluent segment of the population and harmed the lower-income groups that are traditionally the bastion of Likud support. As a result, Netanyahu’s popularity suffered, both within the Likud Party and overall. In 2005, when Prime Minister Ariel Sharon decided in favor of a unilateral withdrawal from Gaza – with no corresponding political or military concessions on the part of the Palestinians – Netanyahu denounced the plan as irresponsible and resigned from his post in protest. Later developments would prove Netanyahu correct. After Israel’s withdrawal, the Hamas militia overpowered the Fatah forces and embarked on a war of attrition against Israel – and its own civilian population – that continues to this day. After his resignation, in 2006 Netanyahu took over at the helm of the weakened Likud Party against the seemingly overpowering Kadima Party of Ariel Sharon and later of Ehud Olmert. 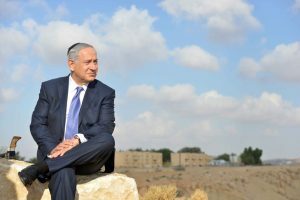 Three years later, Netanyahu was elected prime minister by the Knesset, even though Likud had been narrowly edged out by Kadima, which by that time was under the leadership of Tzipi Livni. In 2013, Netanyahu formed a coalition with Yair Lapid’s new reform party Yesh Atid and other smaller parties. The price Yesh Atid extracted from Netanyahu was the rejection of a coalition with the religious parties and the gradual rollback of privileges long granted to the ultra-Orthodox in Israel. Their generous subsidies were cut and the exemptions from the compulsory military service required of all Jewish Israeli citizens were tightened. Even more importantly, other laws made subsidies to religious schools dependent on their curriculum. Only schools that offered “worldly” subjects such as English and the natural sciences could receive public subsidies. These reforms in educational policy are vitally important to the future of Israel. As a small country that is poor in natural resources, Israel’s survival is dependent upon an educated population and workforce. This is also why Israel devotes more than four percent of its budget to science and research. But such policies only make sense if Israel’s young people receive a good education. This is particularly important with respect to religious Jews and Muslims, which both tend to have large families. If the state fails to ensure that the children of religious families are well-prepared to join the modern workforce and secular economy, Israeli society will be at a distinct disadvantage. As head of state, and as a graduate of MIT, Benjamin Netanyahu is well aware of this fact. But he has chosen to ignore it. The United Torah faction has now succeeded in relieving Haredi schools of the obligation to teach core subjects such as math in order to obtain government subsidies. For the Likud Party, maintaining its hold on power has become more important than Israel’s national interest. Benjamin Netanyahu would be well advised to return his focus to the welfare of the nation. Otherwise his days as head of state are counted and he is in danger of squandering Israel’s future.